I return with more edited photos! First platoon is equipped with early-model Panther G tanks. As such, they don't have the chin armour, have zimmerit paste, and have their back ends modified with the Panther D nozzles, with armour plating. Custom gear on this tank includes the looped up tow cable, a rifle over the tools, extra stowage again cast from other PSC or BF parts, and another custom ammo crate. The oft-converted stowage for extra jerry cans (on either sides of the exhaust) is visible here too. 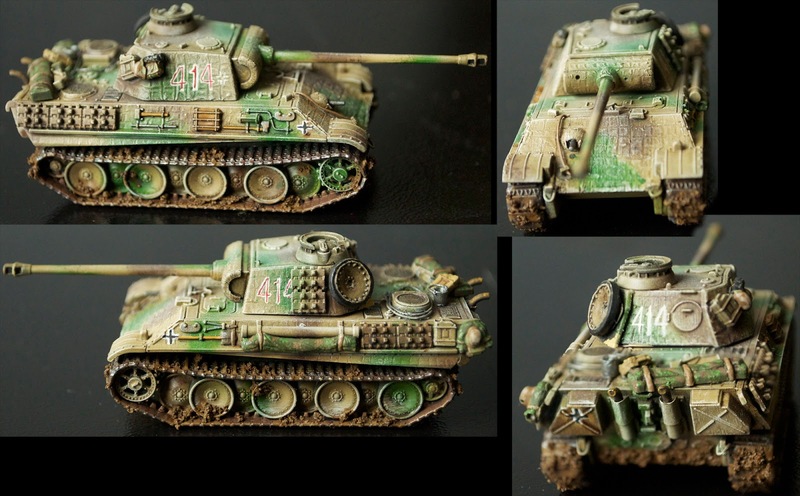 If you click on the image to get a bigger view, you can see how the zimmerit paste technique has worked, and with careful drybrushing it actually looks quite convincing. You can see again on this one how the mud mix applied to the lower quarter of the tank makes it looks like it's seen some things, and I personally love how the tow hooks look painted. It's such a minor detail, but sells the scale. 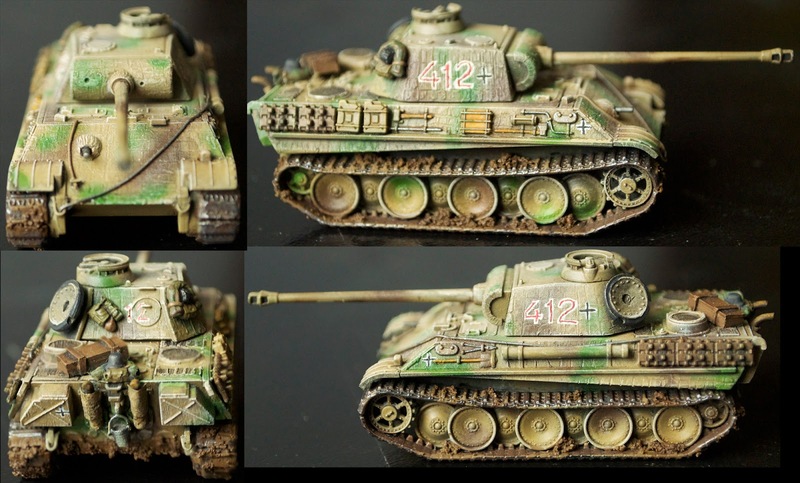 Tank 412 is a fairly standard build. Ubiquitous bucket added to the back, towcable strung across from the front towhook to the back of the tank, ammo crate and spare wheel/gear.. As you can see on this one, the tracks mounted to the tank side were applied after the hull got its camo (in fluff; obviously it was glued to the model pre-paint). Also clear on this one: Using the PSC D-mantlet unmodified is slightly wrong, because they have the binoc gun sight, as opposed to the monoc later one. I had covered the hole with liquid greenstuff before adding the zimmerit paste, and am happy to say the hole isn't visible at all. Tank 413 is sadly missing a side: The photo was blurry and to be honest the image is pretty standard. This is what I jokingly refer to as my "boombox" or "Mickey Mouse" tank, because of the twin roadwheels. Every photo I saw with two on the turret thus made me think of either massive speakers or the aforementioned mouse. This tank also has the rear deck stowage bins, which were cobbled together out of spare bits of schurtzen. Tank 413 also has its side-turret numbers painted on the tracks, which was a relatively common practice once the tracks themselves became ubiquitous. The final tank for this platoon is, obviously, 414. Another relatively straightforward build, but one of the spare cut-off tank jacks was thrown on the back as extra stowage. I have also puttied a camouflage tarp such that it's attached to the gun cleaning rod case, which I've seen once or twice. Sadly, whichever crewman owns the helmet on the back-left of the tank will be unhappy when he next looks at it: It's taken a shell hit at some point (a resin bubble I decided not to fill) and won't be much use! With that, First Platoon is done. I do have Schurtzen painted up for them, and may put them on, if I prefer the way they look with. I also am debating adding foliage, but I do kind of like the look of them pure. I'll dry run a few, and dig back through my photosets to see what was most common. Any thoughts from you folks as to with or without foliage? 2nd Platoon will be up when I can get their photos edited, which will hopefully be by Thursday. enjoy! 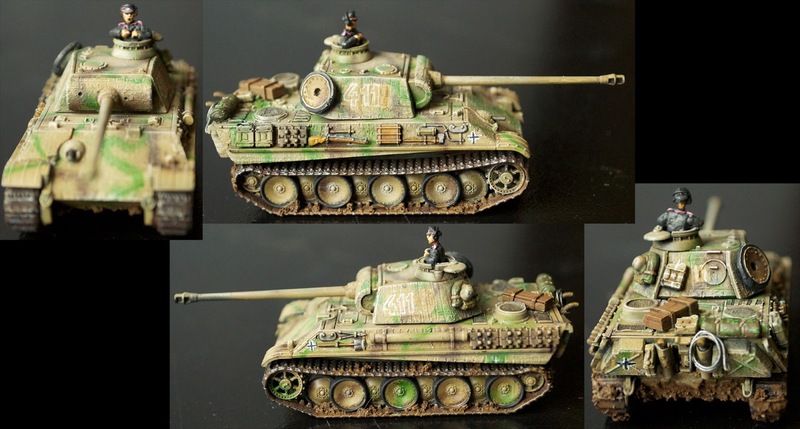 Panther Company Done at Last!